Google + Social Networking Sites from Google What are the Advantages and Features? Google seems to still not satisfied with success in gaining interest in the Android market. Latest news, Google has just released a social networking site which incidentally will rival similar sites such as Facebook, Myspace, Twitter, and others. With this facility Sparks +, you can find people who have the same interests as you. Suppose you really like and want to talk to someone about photography, you can do it here. 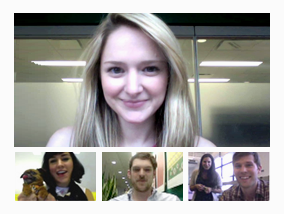 + Hangout is the video calling service offered by Google +. With this feature, you can meet directly with people who are in the "Circle" you. + Mobile facility allows you to access Google + from anywhere. Simply online at your phone, then you can connect directly with people who want to meet in cyberspace. + Location is a means to inform the people in your circle about your current position. You can replace it anytime, let's say you are currently eating lunch alone in a restaurant, by telling everyone in your circle, you might get a friend to lunch together. + Instant Upload is a facility which allows you to share videos, photos or other things very quickly, as the name suggests, instant. + Huddle is a kind of chat group. With Huddle +, you can tell something very quickly to people who you want. And the last facility is + You. Google gives this as the last thing Google's privacy + form for each person. Whether you want to tell you personal things to the public or remain menyimpanya tight, it's up to you alone. In connection with the release of Google + by Google, some parties believe that this networking site to rival and even beat up as a networking site with the most users. Currently Google has noted there are 25 million people who have become + Google users. If the figure is compared with the number of Facebook users, of course is very small. Imagine Facebook currently has nearly 750 million Facebooker. Very far away the difference between the two. But the long duration Google could get 25 million users are indeed fantastic and Google's initial steps to capture the user's + quite effective. Imagine in just a few weeks they've had 25 million users. What if this continues for a month, a year or two years? Surely it would be a separate thing.